Meet at 7.15 pm on second Thursday of every month in St. Brides Major Church Hall. In Britain, the Women's Institute (WI) was officially founded in Llanfairpwll, Anglesey, on 16th September, 1915. The first meeting of Southerndown WI was held on the afternoon of Monday, 1st November, 1948 in Southerndown cricket pavilion. The chairwoman was Mrs. Maxwell. Southerndown WI is a member of the Glamorgan Federation of Women's Institutes (GFWI) which was established in 1923 and the National Federation of Women's Institutes (NFWI) with subscriptions divided between these two groups. In 2008 there were changes to the structure of the individual and County groups. NFWI belongs to the worldwide organisation The Associated Country Women of the World (ACWW) which was initiated in 1929 and subsequently known as Pennies for Friendship owing to the voluntary collection at monthly meetings for women in third world countries; by 2008 this produced 75 per cent of ACWW income. Coffee mornings held once a month at 10.30 am in various venues. Look out for posters giving more details. Monthly raffle. Monthly book sale. Used stamps are colleted in aid of RSPB. Members take it in turns to serve tea or coffee & biscuits. VALREC - Valleys Racial Equality Council by Andrew Jones. Raleigh International by Alex Williams. Army Life by Rowland Potter. The Bayeux Tapestry by Sally Mabey. Caroline, Countess of Dunraven by Ken Rise. Bee Keeping by Mr Lee who explained the intricate and complex life system of these insects. He also spoke about the dangers of a parasitic tick which, if not kept under control, is capable of reducing the amount of honey made. Retailing at C&A by Mike Wilcock. Life as a missionary doctor in India. Canada and a Fly in my Ear by Mrs. E M Elias. Margaret Harris brought along a magnificent collection of hand-made quilts, ranging from pure white to multi-coloured and child to king-size, impressing members with her skill. This led to the request for a quilting workshop to be held. Gardens of the World by Sheila Jewell. The Royal Mint by Haydn Walters. Semi-precious jewellery by Anne Evans. On display were a variety of pieces each formed in clay and enhanced by a many different materials. Romance in Music by Nic Treherne. Experiences of a Belly Dancer by Susan Wyson. Shoe Boxes for Children by Gareth Graves. Hats Galore by Jan Lewis. Judith Lucas, Glamorgan representative for Denham College, gave a comprehensive account and history of the WI's own residential adult education college situated in Oxfordshire. The building is a graceful Georgian house which was purchased by the National Federation in 1947 and named after the first NFWI Chairman, Lady Denman. A teaching block was opened by the Queen in the 1970s. It offers more than 500 courses that are open to anyone, not just WI members, covering various interests and provides qualified teaching and tuition in luxurious and stylish accommodation. The talk was followed by a short video showing the facilities, including sitting rooms and bedrooms. People can also stay for holiday weeks in the main building or a cottage in the grounds. Quick & easy food by Kath Mepham. Cook with Supermarket Savers by Jean Jones. Entertainers, singing, playing music or re-telling anecdotes to amuse or amaze the audience. Discussion evening & plate supper. Southerndown WI hosted and catered for the Spring group meeting held at Ynysawdre in March 2005. A hairdresser and models from Just Lloyd in Tonyrefail gave a demonstration and The Gareth Hall jazz quartet entertained at this ticket-only event. Eight members entered a WI quiz held in Nolton Church Hall, Bridgend, in March 2005 and came a close second to Coychurch WI. Regional Council meetings. The guest speaker at the meeting held in Port Talbot on 26th April, 2005 was Jamie Owen from the BBC; members from 75 WI groups were present and nine people represented Southerndown. The Annual Council Meeting held in Barry on 24th April, 2006 welcomed Anne Widdecombe, MP. On 16 April, 2008 the Wales conference was held in Tenby; the speaker was Trevor Fishlock, who visited this area in 2007 and filmed various local sites of interest, including St. Bridget's Churchyard in St. Brides Major. Representatives from 64 Institutes attended the 2012 spring council meeting held in Barry and the speaker was TV presenter Lowri Morgan. Adam Henson (of BBC TV's Countryfile progamme) was the speaker at the Annual Council Meeting in 2013 and he received a standing ovation. Supplying teas for 70 bell ringers in a competition on behalf of St. Bridget's bell ringers on 1st May, 2005. The visiting team were from a Parish in Devon. Celebratory events such as 80 years of the Glamorgan Federation held at Margam Orangery in 1995. Strawberry teas for 800 must have been a sight to see! In 2013 it will be the 90th anniversary of the GFWI and plans are already being made to celebrate this event. Members commemorated the Wales 90 years anniversary on 11th May, 2005 with a six mile walk from Porthcawl as part of a "Walk Through Wales" event. Starting at Porthcawl harbour, the route followed the coastal path to Sker House where people stopped to have lunch then continued via Nottage to return to the starting point. National Federation of Women's Institutes (NFWI) AGM. This was held at the Albert Hall, London on 8th June, 2005. At the Echo Arena, Liverpool, on 4th June, 2008 the speaker was Sandi Toksvig. WI swap-shop whereby some members visited other groups and vice versa. In June, 2005, they visited Brackla WI. Taking part in the County Show at Margam. In 2005 Southerndown WI darts team won the district tournament held at Aberkenfig Pensioners Hall and went through to the county rounds in Cowbridge. In 2004 Southerndown WI were runners up to Cefn Cribbwr WI. Southerndown WI AGM held in October; this was moved to May for all groups following national debate to try to avoid inclement weather and thus encourage members to attend but in 2013 it was cold, wet and windy! Pilgrimage to Anglesey where the WI in Wales started. Swimming/walking sessions in aid of charity. Taking part in The World's Biggest Coffee Morning to support Macmillan Cancer Relief (usually held yearly in September). Macmillan Cancer Relief is a UK wide charity dedicated to improving the lives of people living with cancer. Special Charity coffee mornings such as that held in 2004 in aid of the Raise the Maize appeal to provide widows and orphans in Tanzania with an income-generating scheme - training in the cultivation and growing of maize (a staple crop) together with purchase of seeds and equipment. Coffee morning with stalls of books, bric-a-brac, plants, cakes, produce, bring & buy, tombola and raffle. Collecting used stamps for the RSPB. "Pennies for Friendship" scheme in aid of overseas work. In 2006 it was announced that 81 Glamorgan WIs had raised more than £2,000. 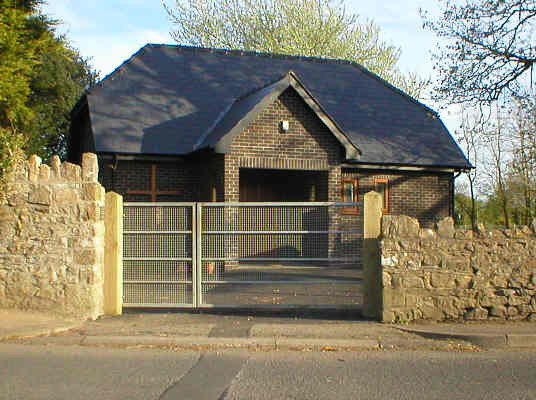 The annual charity chosen by Southerndown WI for 2006-07 was the Women's Refuge. In August 2005, Brackla/Bridgend WI joined the group for a mystery trip. The first stop was Chepstow followed by Gloucester Docks with the opportunity to visit the cathedral, antique warehouses, shops, museum or to take a boat trip. On the return journey a raffle was held. The final stop was at Park Golf Club in Newport for a meal. Duffryn Gardens arboretum evening visit. WI friends and family litter pick to ensure the beautiful countryside and beach is kept clean and free of rubbish which is a danger to wildlife and locals or visitors alike. Your support would be much appreciated and if you are interested in taking part, look out for posters advising of meeting point and time which is usually 11.00 am at Portobello or Rivermouth in late spring, summer and early autumn. Enhancing the villages, for example by making up pots of flowering plants and placing them near All Saints Church, Southerndown. Taking part in a tidy Wales event. 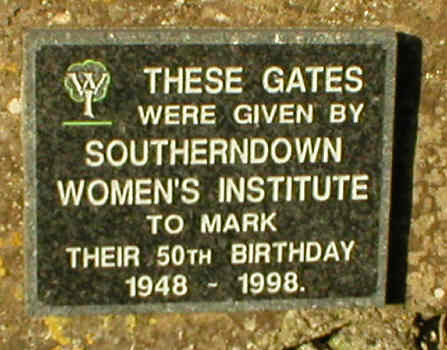 50th Anniversary of Southerndown Women's Institute. The current banner was made by Mrs. Renee Haines.